Every year LG releases new smartphone and we all wish to upgrade our smartphones to keep up with the latest specifications and technology. But the question is what to do with the old smartphones. One of the easiest thing to do is to sell the phone or if you don’t need any money then you can donate or giveaway to less fortunate. In either case, it is important to clean the phone completely. Millions of people have been victim of identity theft just because they forgot to wipe their data from phones. So, unless you want to become one of those statistics, it is better to take precautions. In this guide, we will share couple of methods that should help you to erase all data from LG G5/G4/G3/G2 as well as other LG smartphones. Before taking any action, there is one thing you should pay attention to. The data will be deleted so it is important to keep a backup of the files on the phone that matter to you. 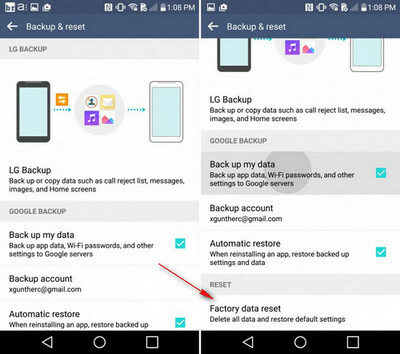 Now, if you have already created a backup of your phone then it is time to delete everything from your LG G5 and make it totally clean like a new bought phone. Step 1: Open Settings app on LG phone. Step 2: Move down the screen and find 'Backup & reset' option. Step 3: Tap 'Factory data reset' and confirm the operation. Please note: the above factory reset is only able to delete personal data on SD card. For data stored on internal storage, it is still in here and can be retrieved by the next owner. So this is not a complete data wiping method. You should be aware of that. Step 2: Open contacts, select all and hit delete. Step 3: Open text messages, select all and hit delete. Step 4: Open Gmail and other online accounts and sign out from everywhere. Step 5: Uninstall all applications including WhatsApp, Facebook messenger and any other app that may contain your private data. Step 6: Double-check everything to see you have wiped the phone entirely. Please note: Now this method can be time consuming depending on how much data you have on your phone. If you have tons of files then you should try a professional tool. And one of the drawbacks of this method is that these deleted data can be easily recovery by using any data recovery tool. There are numerous software present online that could recover these deleted files. 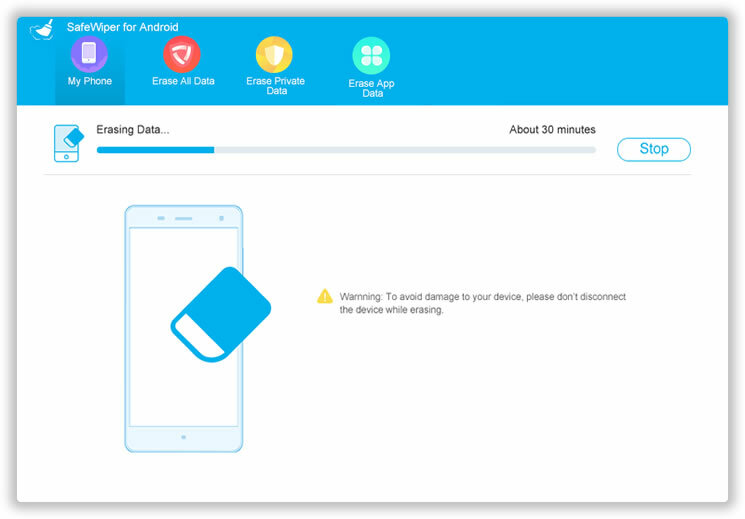 So, if you want to delete everything permanently then we will recommend using Android Data Eraser. 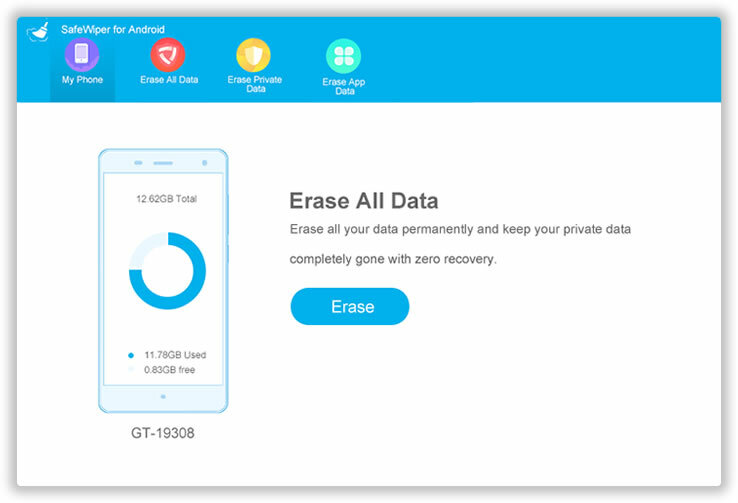 It is a great app to erase all data from your phone and make sure that nothing can be recovered. The deletion process will be permanent and no content can be recovered ever again. So, make sure to have a backup of your phone before using this software. Now connect your phone to PC via USB data cable. The software will automatically recognize your device and show it on the main screen of the software. 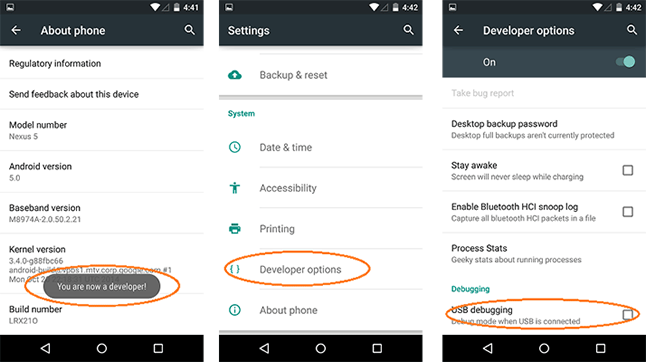 Make sure to enable USB debugging mode on your phone to run everything smoothly. If you have done everything correctly, then you will be able to see "Erase All Data" option. Click that and let the software scan the entire phone. This process may take few minutes depending on how much data it is scanning. 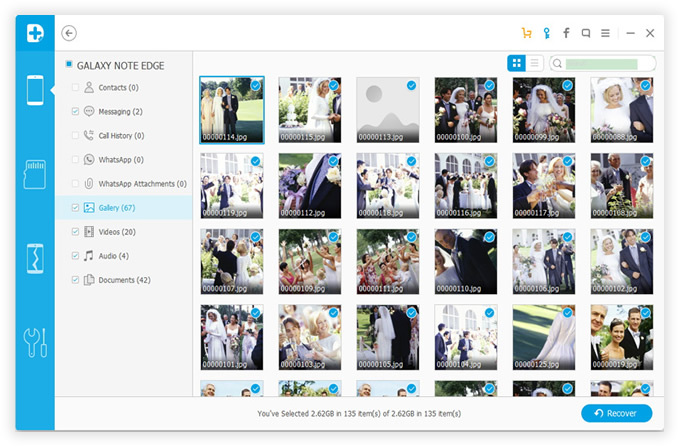 Once the scanning process is done, the software will let you preview everything before deletion. The content will be well-categorized so that you can navigate through each and every tab and preview what to delete. Once, you have confirmed everything, you can hit “Erase" button and the software will permanently delete everything from your phone. Now, you have successfully deleted everything from your LG G5 phone and you may now sell the phone to anyone without having any worries. In this short guide, we have discussed how to erase everything from your LG G5 phone but you can use the same software to delete everything on any Android phones and tablets. It is recommended to have a full back up before you proceed with these methods as you won’t be able to recover them at all.